Conrad Dickinson is a proud born and bred Northumbrian, who, apart from a spell as an Army Officer (specializing in Arctic Warfare) has spent the majority of his working career in the North East; successfully building his family business. However, he is probably better known for having put the North East and Britain on the map with his Polar Expeditions. He is a fellow of the Royal Geographical Society. Conrad completed his Polar Trilogy by pulling his 150kg sledge to the Geographic North Pole in partnership with Canadian Richard Weber. Seasoned explorers have described this as the hardest expedition in the world; considerably harder than climbing Everest. We are talking temperatures of -50ºC; travelling on the frozen Arctic Ocean, possibility of Polar Bear attacks, crossing thin ice and negotiating open water. The tide and currents were everyday pushing him back to the coastline and contorting the ice into a building site of ice rubble and thousands of pressure ridges towering 5 metres high. And yet after 52 days of these torturous conditions they reached the Pole. Only 10 people before them had ever achieved this goal via the hardest route; and of course many have died trying. Conrad’s South Pole expedition involved pulling a 130kg sledge from the edge of the Antarctica continent all the way to the Geographic South Pole. Not content with that, the team of 5 skied all the way back using powerkites. By doing this he, and his wife Hilary, are the only Brits to ski all the way to the South Pole and back. At the time of the expedition there was only one other recorded expedition to complete this arduous return to the South Pole and this was completed by the great Norwegian explorer Roald Amundsen in 1911. We all know what happened to Captain Scott’s party; who attempted this journey. It is difficult to believe what it is like to spend 75 days camping in such dangerous terrain. The international expedition community dubbed this one of “the cleanest and boldest expeditions ever to take place in Antarctica”. He has also led a team of North Easterners to Siberia and were the first British group to traverse the 700 kilometres along the frozen surface of the largest lake in the world, Lake Baikal. The aim of the expedition was to demonstrate “Northern Spirit”; that special ingredient for which this region is famous and that helps North Easterners “punch above our weight” compared to the rest of the U.K. Upon his return from these amazing expeditions he has given so much back to the North East community; charity talks for scores of local clubs, groups and schools, fundraising for Percy Hedley, Alzheimer and Cancer Groups as well as encouraging and motivating Scout Groups and a whole range of individuals in both their personal and professional lives. 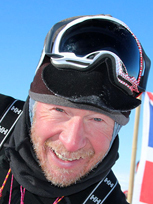 In January 2012, Conrad supported the first ‘Spine Race’, a 268 mile winter ultra-marathon encompassing the entire Pennine Way. 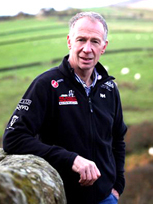 Conrad’s experience of extreme environments, and of his native Northumberland, helped the race organisers plan and implement safety and logistics. In 2015 conrad guided triple cancer survivor Patrick Macintosh to the South Pole. Conrad has recently taken on the challenge of an epic pilgrimage "Norway, End to End" consisting of travelling 2700km in 120 days (January 2016 - April 2016) with his wife Hilary Dickinson. Their aims are simple: to enjoy, engage and explore the delights of Norway - whilst hopefully raising some money for their chosen charity Northumberland Wildlife Trust. They will be the first British couple to complete this epic route (and possibly the oldest), should they be successful.